Last week Russia's President Vladimir Putin reiterated that privatisation of state enterprises is a necessary precondition for further financial support. The International Monetary Fund also insists on privatization in its recommendations. But many in Belarus – both in the government and in the opposition camps – bitterly oppose privatization. Belarusian authorities still control the largest and most profitable enterprises in the country. Nearly full ownership over the economy allows them to maintain tight control over politics as well. For instance, they can put pressure on any state enterprise to dismiss unwanted individuals who then will struggle to find another job. The workers dislike the idea of privatization too. They know that nearly all state-owned enterprises need to cut their personnel to become more efficient. Keeping them employed is important for the state, but not for future private owners. Directors of state-owned companies also resist privatization because the new owners will inevitably replace them. According to chairman of Belarus State Property Committee Georgy Kuznetsov, directors of state enterprises are not interested in privatization at all. At his July press conference he gave examples from various parts of Belarus – Lida, Baranavichy and Homel. After investors expressed interest in state enterprises based in these cities, their directors managed to lobby authorities to formulate conditions of privatization which any reasonable investor would refuse to acept. As a result, these enterprises remain state-owned and the directors keep their positions. Many in the ruling elite and in the opposition are also concerned that Russia will become too powerful if it acquires large Belarusian state enterprises. Vladimir Putin recently admitted that he considered it very desirable for Belarus to be incorporated into Russia. That made many in Belarus, both on the government ant the opposition side, worried. According to a once very influential Belarusian Prime Minister Vyachaslau Kebich, "The main aim of Russia is to totally swallow Belarus." The Belarusian economy has been subsidized for decades by Russia. When Moscow reduced its subsidies in 2010 the Belarusian economy began to crumble and Russia is clearly trying to take advantage of it. Belarus is still living through hyperinflation and its national currency has already lost nearly half of its value. 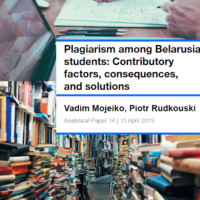 Belarus struggles to gain external financial aid and privatization is the most obvious source of income, in addition to being a precondition for further external loans. But foreign investors are not particularly enthusiastic about Belarusian privatization. They know that Belarus has an unstable legal regime and much depends on investors' personal connections. Moreover, the United States and the European Union imposed sanctions on a number of Belarusian companies which makes the already poor investment climate in the country even worse. That makes investments in Belarus risky. Russian businessmen well-connected to Kremlin clearly have an advantage over other potential investors. Because of the non-transparent nature of the Belarusian economy and decision-making, it is usually not the highest bidder but the best connected who eventually signs privatization contracts. Over recent months, Belarus started selling stakes in large state enterprises. The recent example is the largest manufacturer of pump equipment in the former Soviet Union JSC Bobruisk Machine Building Plant. Now the majority belongs to a Russian financial group Hydromashservice. In some cases the Belarusian government opts for a "delayed" privatization. 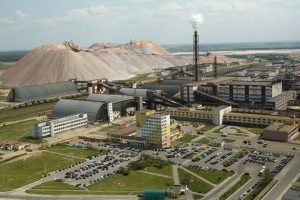 Russia’s Sberbank and Germany’s Deutsche Bank agreed to provide a joint two billion dollar loan to state-owned Belkali, one of the world's largest producers of potash fertilizers. The loan was offered on the security of 35 percent of the company’s stock. If this loan is not repaid, these banks would be entitled to take over a large stake of Belkali. Earlier this year, the Belarusian government also provided guarantees to the Finance Ministry of Azerbaijan which agreed to extend a $300-million loan to Belaruskali. Because of the unattractive investment climate and political risks in Belarus, many enterprises are sold at cheap prices. The authorities are forced to act quickly because of the depth of the financial crisis in the country. Some analysts think that the less control the state has over the economy, the more likely political changes are. Others fear the rise of Russia's influence and nod to examples of China and Russia where despite significant foreign investments political regimes remain undemocratic. These days privatization is no longer optional for Belarusian authorities. With the advent of the cold season, it will be even more difficult to keep the sinking economy afloat. Without serious structural reforms or massive financial support from Russia, privatization will only help the authorities to win a few years before another crisis. The main problem is that the Belarusian government has neither the intellectual capacity nor the desire to implement serious reforms. Belarus As a New Yugoslavia on the Global Arms Market? Opposition politicians regularly accuse Belarusian government of dubious arms dealings. The recent sanctions of the European Union imposed against Beltechexport, the largest Belarusian arms exporter, are also based on the same premises. Is Belarus really a serious player on the global market of weapons? Detailed information on trade in weapons is difficult to obtain inside the country, and only the UN Register on Trade in Conventional Arms yearly publishes information on these arms deals. This publication contains no information on the contracts’ sums. 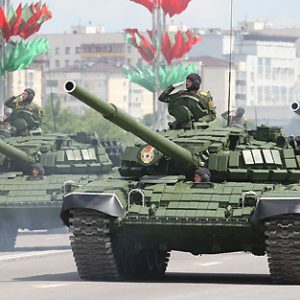 According to the UN data, in 2010, Minsk sold Yemen sixty six tanks T-80, Sudan – one Su-25, Nigeria — two attack helicopters Мі-24, Uganda — one Мі-24, Azerbaijan — one Su-25 and 30 122-mm towed howitzers D-30. Nearly all arms sold this year as well by Belarus have been produced in the Soviet Union or Russia. Therefore, Belarus hardly has any chance of becoming what earlier Eastern Germany or Yugoslavia were in global arms and ammunition markets – sources of cheap but good arms and ammunition – small arms as well as tanks and artillery. Belarus cannot replicate their model for a simple reason, it does not produce any self-sufficient products, and everything ‘made in Belarus’ has to be installed on or used with Russian- or Ukrainian-made arms. When the country had Soviet arms stocks and they were relatively modern, it could supply diverse products to the arms markets in 1990s and early 2000s. For a couple of years Belarus was in the top-10 global arms exporters. Yet, the government did not modernize national economy, and military industry was no exception. Old stocks are empty, new production lines – non-existent. No wonder, the geography of Belarusian foreign relations in military dimension has been restricted by its capacities. The country has sustainable military cooperation only with Communist China and Vietnam. In case of China up to 1/4 of all official contacts involve military matters. Recent attempts – since mid-2000s – to conquer new weapons markets in the Persian Gulf thus far remained not very successful – it is not easy to sell the products based on Soviet technical standards in Arab countries of the Gulf, especially if one is limited in his negotiating capacities in particular with kickbacks to local officials. There are anecdotal evidences that it is the case. Of course, much is hidden behind the official data. Secrecy is a major feature of military equipment and arms markets throughout the world and the Belarusian government is too famous for withdrawing any possible information. There are regular unproven speculations on its alleged breaking some rules or dealings with some rogue regimes. Almost every year the Jerusalem Post reports on Belarus selling anti-aircraft systems S-300 to Iran, and every time the news turned out to be false. This February, the UN made a statement on alleged illegal arms shipments of Belarusian weapons to former Ivorian president Laurent Gbagbo, and took it back in some days. In any event, there is no hard evidence on Belarusian arms or military-related services in violation of international embargoes or sanctions to any country whatsoever. Lukashenka has been careful in his arms dealings so far. For example, Belarusian military and civilian officials only rarely contacted Iranian military officials, knowing US sensitivities in this regard, and almost certainly they do not have any actually sensitive technologies or products to share with enemies of the US. However, while the Belarusian regime as a whole can hardly be accused of arming any state or non-state actors it is not supposed to, some regime's insiders may be really involved in such business. Yet if for them and their clans such business can indeed bring huge profits, for the country it brings next to nothing due to the volumes traded and the fact that all the income goes to the private pockets. The same situation is with military specialists – if there are some facts they concern private initiatives. Nevertheless, recently, the behavior of Belarusian government may become more risky. Under the financial pressure it is seeking money and having experience with trading weapons it may attempt to sell now more products and services illegally. First signs of this trend might be the rumors of Belarusian mercenaries in Libya supporting Gadhafi regime. They are plausible, as in the past Belarusian firms for years unsuccessfully tried to get contracts to sell weapons and modernize air defense system in this country. In these circumstances the future behavior of Minsk will to a large degree depend on how much attention the Western countries pay to its risky deals. And sometimes they neglect the issue. For example, bombing of a French military base in Côte d'Ivoire by Belarusian mercenaries in 2006 caused no major consequences for the Belarusian government. If Belarus help to Gadhafi or other rogue regimes goes unnoticed today, Minsk may move towards more extensive dealings of this kind. However, it is highly improbable that it will pursue any strategic plan in extending such trade or own arms industry. Lukashenka is not a visionary leader building up any ideological project, he is opportunistic politician using whatever is available at its hand at the moment to stay in power.